The remaining troops of the Norwegian Army (6th Division) surrender, after Norway surrenders unconditionally. Italy declares war on Britain and France, effective from the 11th June 1940. British advance breaks through Vichy opposition in Syria. The United States wins contract for Bolivia’s entire tungsten supply, depriving Japan of the mineral, vital to strengthening metal alloys in arms production. 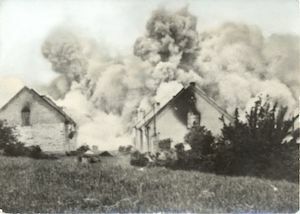 Prague radio announces the extermination of Lidice, a village of about 2,000. All the men were shot and women sent to concentration camps. All buildings are razed to the ground as a reprisal for Heydrich killing. Another German offensive in the East begins as two German armies of 33 division, five of them Panzer, attack fromÂ Kharkov on the Volchansk Front, a massive assault that will roll on until the 26th,scattering the Russian forces ahead of them. Panzer Army Afrika finally captures Bir Hacheim, a strongpoint fiercely defended by Foreign Legionnaire’s of the Free French Forces. The British Eighth Army is pushed towards the Egyptian border. British tea planter uses elephants to rescue 68 Burmese refugees fleeing Japanese across the Daphna River, India. The United States approves construction of “Big Inch” pipeline to transport crude oil from Texas to northeast states, bypassing U-boats. A co-ordinated air offensive is begun, with the US 8th Air Force, flying precision bombing missions by day and RAF Bomber Command, flying area saturation missions by night, against major German cities. German counterattacks against Allied invasion forces are unsuccessful for lack of armoured reserves in the area. Troops of the 2nd SS Panzer Division ‘Das Reich’ massacre the inhabitants of Oradour-sur-Glane in France. 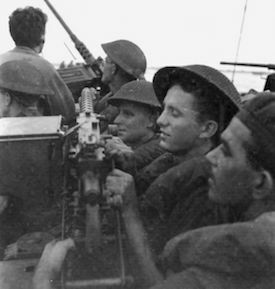 The Australian 9th Division makes two landings in Brunei Bay, Borneo.